I LOVE Summer time, every single thing about it, but most all the garden fresh tomatoes and basil right from my backyard. I know it isn't Summer yet, but the other night the weather was so gorgeous I couldn't resist snagging up a batch of basil and some heirloom tomatoes. With them we made a homemade margarita pizza that was insane, I will share that another day. So this morning I decided I needed to use up the leftovers. 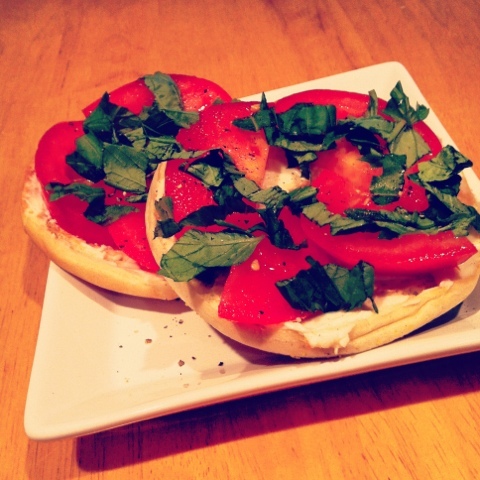 Toasted bagel thin smeared with a light laughing cow cheese and topped with the tomatoes, basil, salt, and fresh cracked pepper. INSANE!!!! !